Conservation officers in B.C. are urging vigilance after a fourth grizzly bear attack in two weeks where someone startled a bear near a food source, and was mauled. 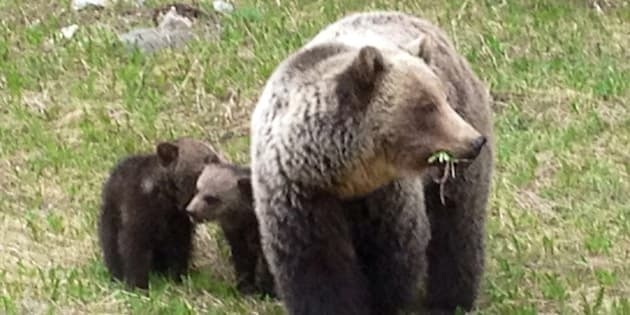 This time, a hunter came between a mother grizzly, her cub and a recent elk kill, at about 7:30 a.m. MT yesterday northeast of Sparwood, in the East Kootenay. The attack was defensive, and the hunter was simply in the wrong place at the wrong time, said the B.C. Conservation Officer Service. "He had no warning whatsoever," said Sgt. Cam Schley. "It was just a very quick and sudden attack. There was nothing he could have done differently to have prevented that." The man is now recovering in Kelowna General Hospital with serious, but not life-threatening injuries. Conservation officers have posted a notice that the area is closed, and will monitor it for bear activity — but will not try to trap the bear, said Schley. This is the fourth such attack in two weeks, and the third in the East Kootenay region of B.C., following similar encounters near Cranbrook, and Canal Flats, and another south of Fort Nelson. - Outside of Cranbrook on Sept. 1, a man hunting elk encountered a mother bear with cubs who may have been after the same prey. She was startled, and charged. - South of Fort Nelson on Sept. 6, two hunters were carrying sheep meat when they came upon a mother bear with cubs, who attacked. - Near Canal Flats, on Sept. 9, a fisherman startled a grizzly who bit him on the hand and leg. In the East Kootenay, the hot, dry summer — and poor berry crop — has left bears stressed and desperate for food, said Schley. "This is causing bears, both black and grizzly bears, to forage for food in places where they are not normally this time of year. So far in B.C. this year, there have been seven grizzly bear attacks, compared to just three for all of 2014. There have been five black bear attacks so far this year, including one that killed a 27-year-old man near Mackenzie, compared to four in the entire year of 2014. Shley is warning anyone using the outdoors in the East Kootenay for the next two months to be vigilant, and to expect heightened bear activity through the fall.